Press Digest: Putin outlines peace plan; have militias sabotaged gas lines? RBTH presents a selection of views from leading Russian media on the latest developments in Ukraine, featuring analysis of Russian President Vladimir Putin’s plan for resolving the conflict in eastern Ukraine, as well as accusations by Kiev that pro-autonomy forces in the Donetsk and Lugansk regions have been sabotaging gas pipelines. The main topic of discussion in the Kommersant daily is Russian President Vladimir Putin’s proposed plan to resolve the conflict in south-eastern Ukraine, which includes halting the offensive operations of the pro-autonomy militia forces, withdrawing Ukrainian troops to prevent the use of artillery in the Donbass, and further joint efforts to stabilize the situation. The expert notes that achieving a lasting peaceful agreement will not be easy. The "war party" (which Prime Minister Arseniy Yatsenyuk belongs to) has considerable influence in Kiev. There may be problems with the militia leaders, over which, "contrary to popular belief, Moscow does not have 100 percent control." Expert magazine notes that Putin proposed the conflict resolution plan against the backdrop of continued “aggressive rhetoric” directed towards Russia from Western countries, particularly the United States. 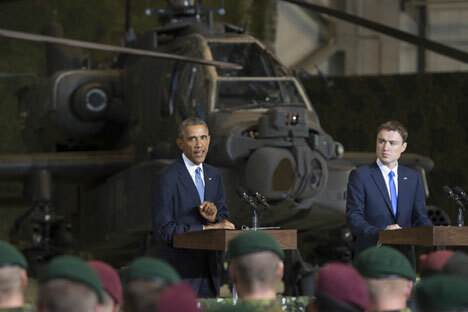 Speaking in Tallinn, Estonia, U.S. President Barack Obama announced the deployment of a U.S. military base in Estonia, called for a review of the Russia-NATO Founding Act, and talked about the effectiveness and appropriateness of the West’s sanctions policy towards Russia. Expert believes that Moscow is trying to reduce tensions and is coming forth with a peace initiative. At the same time, according to the publication, the implementation of the plan for a peaceful settlement in the Donbass is in itself a challenge for Poroshenko and could even lead to a "serious political crisis" in Ukraine. One of the key points of Putin's plan involves the exchange of all prisoners without preconditions. According to Expert, the plan entails releasing the prisoners from volunteer battalions who may have become disloyal to the president. "It is possible that many of them will come back to Poroshenko’s administration bearing arms, demanding that the president be held accountable for the decisions that led to the failure of the military operation," the publication writes. Meanwhile, Gazeta.ru reports that the Ukrainian authorities are accusing south-eastern militia forces of sabotaging the supply of Russian gas through Ukrainian territory. The publication quotes a statement issued by Andrei Lysenko, spokesperson for the information-analytical center of the National Security and Defense Council of Ukraine, who says that "the actions of the militia in Ukraine have resulted in a grave loss for the country's economy." Lysenko explained that the militia’s operations have seriously damaged gas pipeline infrastructure in the Donetsk and Lugansk regions, warning that the damage “may pose a threat to European gas supplies." At the same time, Deputy General Director of the National Energy Security Fund Alexei Grivach told Gazeta.ru that he is sure such statements by Ukraine are simply an attempt "to find an alibi" in the event that the transit of Russian gas to Europe is halted. "And it’s an alibi with a lot of holes, too, since transit pipelines do not pass though Lugansk or Donetsk," Grivach noted. According to Nikolai Petrov, professor at the Higher School of Economics, “Ukraine does not want to look like the only culprit in potential disruptions of transit" and is trying to attract attention to solving the gas issue in the run-up to the tripartite talks between Russia, Ukraine, and the European Union scheduled for September 6.